I feel like someone's got our back... it gives us confidence. 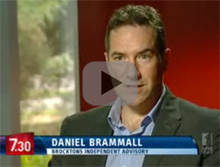 Brocktons Co-Director, Daniel Brammall on The ABC's 7:30 Report pushing for financial planning industry reforms. It's independent. It's transparent. It's easy. We are not a financial supermarket. We are advisers. We're here to help you make decisions for you and your family. We're here whenever you need us. You're always in control. Independent Financial Advice. For all Australians.